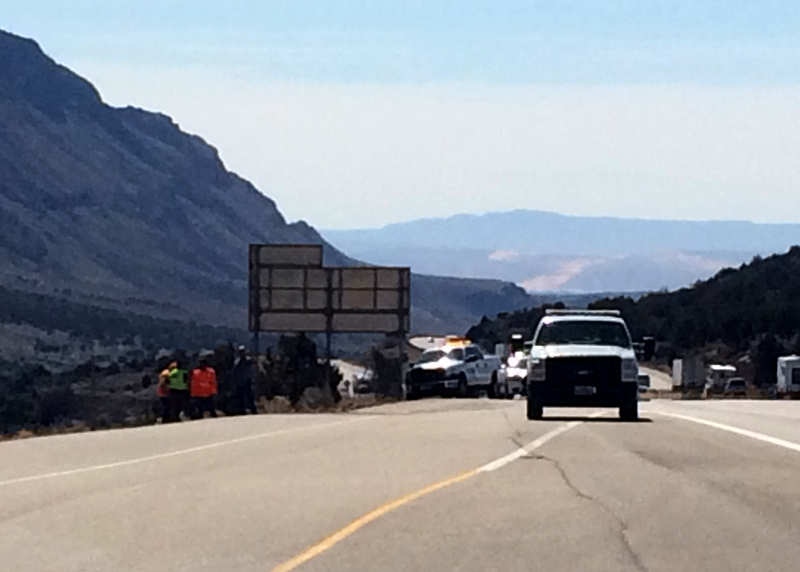 CEDAR CITY — Northbound exit 36 to New Harmony was closed for an hour Wednesday around noon after the drive shaft of a semitrailer fell off the truck, shot back up into the gas tank – impaling it – and then dumping 110 gallons of diesel fuel across Interstate 15. Multiple hazardous materials crews and law enforcement responded to assist with cleanup and traffic control following the 11:30 a.m. call from the Cedar Communication Center. Utah Department of Transportation workers spread dirt and kitty litter across the diesel spill to soak it up for removal. The Richfield driver finished dropping a load of topsoil off in St. George and had just started the first leg of his journey home when disaster struck, said Utah Highway Patrol Trooper Matthew Pratt. The truck’s drive shaft dropped while climbing the Black Ridge, just before milepost 35, leaving the truck to climb the rest of the hill on momentum only, spilling fuel from the ruptured tank the entire way. “He had just filled up the tanks,” the trooper said. As the truck came to a stop at the top of the hill, the driver noticed a small fire between the cab of the semitrailer. The fire was so small, however, it burned out before firefighters arrived on scene, said Pratt. The preliminary cleanup of diesel was managed by UDOT, but the owner of the semitrailer is responsible for hiring a professional team to clean the area right away, Washington County UDOT Operations Manager Todd Abbott said. “The contaminated road base material will be hauled off and disposed of properly,” Abbott said, explaining there are two ways of dealing with the diesel-soaked dirt. The soil can be dumped at an approved landfill or recycled through a special type of dryer that reaches over 300 degrees, vaporizing the chemical and releasing it from the soil. 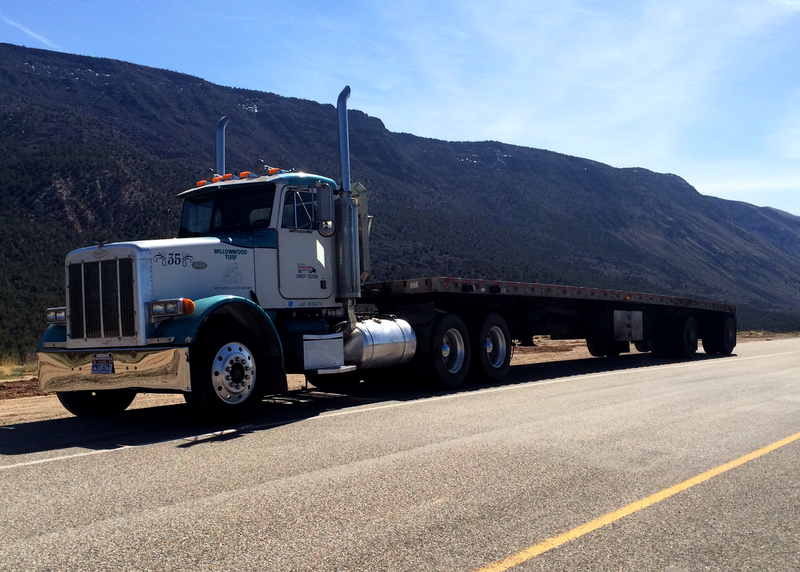 Trucking companies typically hire an outside crew that specializes in cleaning hazardous materials and then UDOT follows up on each incident to ensure cleanup has been completed in a timely manner, Abbott said. Timeliness is essential because Utah is full of waterways that could easily become contaminated, requiring a much more involved level of cleanup. It should take less than a half day of work for specialty crews to clean up Wednesday’s spill, he added. The whole thing turned out much better than it could have, Pratt said. The driver of the semitrailer had a good disposition despite the long delay in his travels. 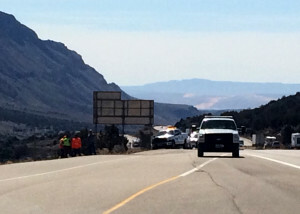 The Hurricane City Fire Department, Hurricane Valley Ambulance, and Leeds Area Fire Department responded to the incident, along with Utah Department of Transportation and Utah Highway Patrol.